Journal of Plant Nutrition and Fertilizers (ISSN 1008-505X), a peer-reviewed sci-tech academic journal with English abstracts, key words and references, is superintended by the Ministry of Agriculture and Rural Affairs of China, sponsored by the Chinese Society of Plant Nutrition and Fertilizer, administered by the Institute of Agricultural Resources and Regional Planning, Chinese Academy of Agricultural Sciences. Journal of Plant Nutrition and Fertilizers was started in September of 1994，and officially published in 1999. 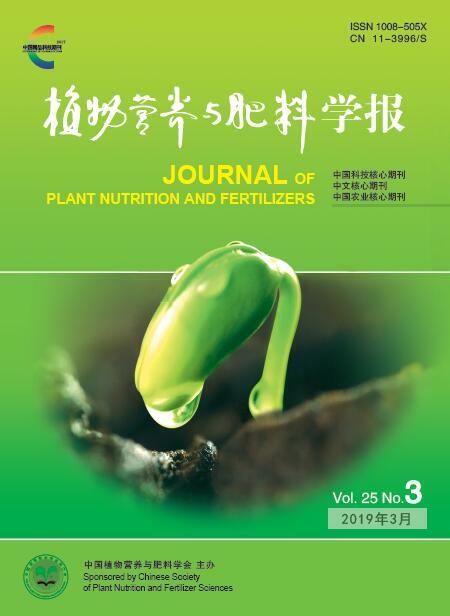 As one of the high-level academic journals in the field of integrated agricultural sciences in China, the journal has the highest impaction factor in both the fields of fundamental agricultural sciences and agronomy sciences in China since 2008. It has been honored a member of Core Sci-Tech Journal of China since 2013, and was one of the 100 Outstanding Academic Journals of China (2007), Outstanding S&T Journal of China (2008, 2011, 2017). The journal is accepted by some important international and national databases and retrieval systems, such as Chemical Abstract (CA) of USA, Centre Agriculture Bioscience International (CABI), Japanese Science Technology Agency (JST), Chinese Electronic Periodical Services (CEPS), Chinese Academic Journal Comprehensive Evaluation Database (CAJCED), FAO database (AGRIS), etc. as data source. ObjectivesThe grain phosphorus content and its relationship to major agronomic and nutritional traits of the high-yielding wheat cultivars were studied in drylands, aiming to provide reference for optimizing fertilizer management and breeding new cultivars of both high yield and high nutritional quality. MethodsA field experiment was conducted in Weibei dryland during 2013 to 2016, there were 123 wheat cultivars grown under fertilization (N 150 kg/hm2 and P2O5 100 kg/hm2) and no fertilization conditions. 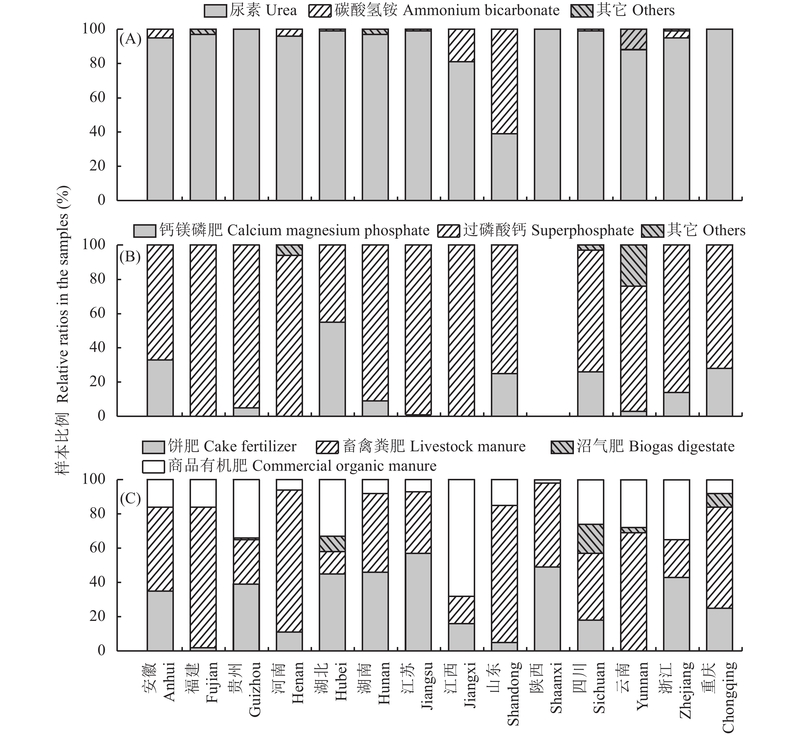 The biomass accumulation, yield components and NPK uptake were analyzed. The relationship between grain P contents and the main agronomic traits of the cultivars were discussed. ResultsThe average yield of the high-yielding wheat cultivars was 6.9 t/hm2 and the grain P contents varied from 2.5 to 3.7 g/kg with a variation of 51.1%. The grain yields were significantly and negatively correlated with the P content, every increase of 1000 kg/hm2 in yield would lead to a decrease of 0.28 g/kg in P content. The grain yields and yield components of the high- and low-grain P cultivar groups were similar, while the high-P group had higher grain N contents and similar grain K contents, compared with those of low-P group. The high-P group accumulated higher N and P in grain and straw, but the N and P translocation from straw to grain were not significantly different between the two groups. The high-P group exhibited lower K translocation than the low-P group. Fertilization increased N, P and K uptake in grain and vegetative parts of both groups, with greater increase for the high-P group, but reduced the translocation of N, P and K from straw to grain, especially for the high-P group. ConclusionsThe high-yielding and high-grain P content wheat cultivars have higher N content and uptake, and their response to fertilization is more significant. Fertilization will increase the biomass and N, P and K uptake, and consequently decrease the harvest index of the high-P cultivars. Therefore, cultivars with medium P contents and high P harvest indexes are encouraged in breeding high-yielding wheat. Fertilization regime should be adjusted according to the cultivar’s grain P content for increasing grain N contents and acquiring high-yield and high-quality wheat products in dryland. ObjectivesThe regulation effect of humic acid on the synergistic effect of phosphate fertilizer is closely related to its chemical structure. In this paper, the effects of sulfonated humic acid phosphate fertilizers processed with different paths were compared, which would provide a basis for the preparation of high efficient humic acid phosphorous fertilizer.MethodsA soil column cultivation method was used for the experiment on field condition and wheat was used as tested crop. Common phosphate fertilizer (P) and conventional humic acid phosphate fertilizer (HAP) were used as controls. Sulfonated fertilizers included sulfomethylated humic acid phosphate fertilizer (HA1P), hydrogen peroxide + sulfonate methylated humic acid phosphate fertilizer (HA2P), nitric acid + sulfomethylated humic acid phosphate fertilizer (HA3P) and hydrogen peroxide + nitric acid + sulfomethylated humic acid phosphate fertilizer (HA4P). We investigated the P content in wheat plant and grains, the yield and yield composition, economic benefits, and analyzed the available phosphorus content in 0−80 cm soil.Results1) Compared with CK, all the C-HA, C-HA1, C-HA2, C-HA3, C-HA4 treatments did not show significant effect on wheat grain yield. Compared with P, the yield of wheat in HA1P, HA2P, HA3P, HA4P treatments were increased by 17.8%, 10.1%, 17.5% and 11.1%, and the yield in HAP was increased by 6.3%, lower than those in sulfonated HAPs. 2) Compared with HAP, the P uptakes of aboveground in HA1P, HA2P, HA3P and HA4P treatments were increased by 12.3%, 12.3%, 9.2%, 10.8%, respectively. 3) Compared with HAP, HA1P and HA3P treatments could increase the agronomic efficiency of phosphate fertilizer by 23.6% and 7.1%, respectively. 4) Compared with HAP, the available phosphorus contents in HA1P, HA2P and HA4P in 0–20 cm soil layer were increased by 17.5%, 16.2%, and 17.2%, respectively.ConclusionsSulfonated humic acid phosphate fertilizers perform better synergistic effects than common humic acid phosphate fertilizer in increasing the availability of phosphorous fertilizers in soil, so lead to better promotion effect in the absorption and utilization of phosphorus by winter wheat, and higher yield as a result. Among the four tested processes, the sulfomethylated humic acid phosphate fertilizer (HA1P) produces the best effect. ObjectivesOur previous work confirmed that grain number per unit area could been maintained through delaying sowing date. This study further investigated the development characteristics of florets and compared their differences in differentiation and degradation under different sowing dates, and analyzed the relationship between photosynthate accumulation and distribution and floret development and grain setting. The purpose was to provide references for wheat high-yield cultivation.MethodsField experiments were conducted during the 2014−2015 and 2015−2016 at the Experimental Station of Dongwu Village (35°57′N, 117°3′E), Shandong Province, China. Two wheat cultivars of Tainong18 and Jimai22 were planted as the experimental materials. Winter wheat was sowed on September 24, October 1, 8, 15 and 22, respectively. Binocular microscope was used to record the dynamics of differentiation and degeneration during the floret development. The final grains number, the dry matter and nitrogen accumulation of spikes and stems at anthesis were investigated, and the accumulation rate of dry matter and nitrogen in the whole plants and spikes during the floret degeneration stage were calculated.ResultsAmong the five sowing date treatments, the number of fertile florets and final grains per unit areas were maintained same, but the maximum number of differentiated florets per unit area was significantly reduced, and the survival rate of florets was significantly increased. When the sowing date was delayed, the degenerated rate of florets was significantly reduced. The accumulation of dry matter and nitrogen in the whole plants and spikes were significantly accelerated during the floret degeneration stage, thus ensure the constant spike dry weight and the ratios of dry matter and nitrogen between spikes and stems at anthesis. The number of fertile florets at anthesis exhibited significant and positive correlations with spike dry matter weight, the ratios of dry matter weight and nitrogen accumulation of spike/stem, and the accumulation rate of dry matter and nitrogen in the whole plants and spikes and survival rate of fertile florets, respectively. The number of degenerated florets per square meter produced by effective stems and ineffective tillers significantly reduced as a response to delay sowing date, and the number of degenerated florets per square meter produced by ineffective tillers was even more significantly decreased. Enhanced the proportion of the main shoots in the population of photosynthate can be in favor to maintain the number of fertile florets and decrease the number of degenerated florets, and reduce the depletion of florets death. In addition, the growing degree day production efficiency of fertile florets increased and the growing degree day production efficiency of degenerated florets reduced as a result of delaying the sowing date.ConclusionsDelayed the sowing date could increase the survival of florets through inhibiting the floret degeneration. The maintenance of the number of fertile florets is closely related to the photosynthate metabolism of plant. Delaying the sowing date could increase the proportion of the main stem in the plant population, which is beneficial to reduce the invalid consumption and improve the utilization efficiency of resource. ObjectivesThe interaction of N rate and plant density often makes troubles to evaluate the nitrogen use efficiency (NUE) of maize. It is of great importance to analyze the effects of interaction of N rate and plant density on physiological processes of N absorption and utilization and yield formation of maize for revealing mechanism and pathway of enhancing NUE and yield synchronously in maize. MethodsField were conducted using a typical commercial hybrid Zhengdan958 as tested materials in Shulinzhao and Salaqi, Inner Mongolia. The tested plant densities included 45, 75 and 105 thousand plants per hectare (D4.5, D7.5 and D10.5), and N rates included 0, 150 and 300 kg/hm2 (N0, N150 and N300). 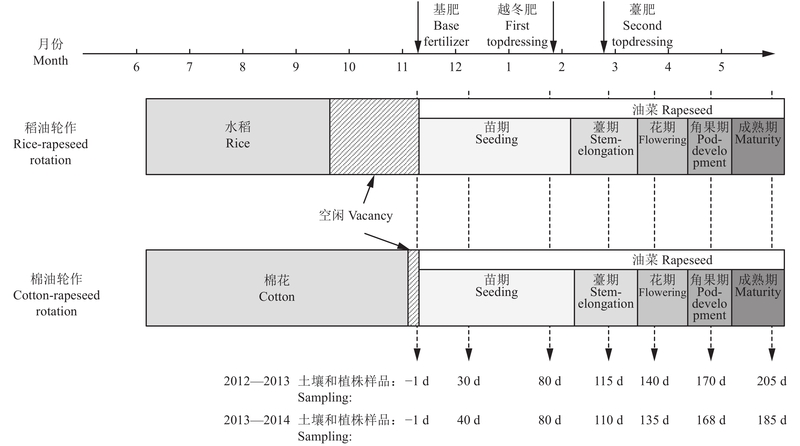 At the stages of 14-open-leaves (V14), silking (R1), grain filling (R3) and ripening (R6), plant samples were collected, and divided into different parts for measuring biomass, nitrogen contents. The nitrogen use efficiencies were calculated. ResultsCompared to N150, N300 neither enhanced the total carbon and nitrogen accumulation of maize, nor improved individual plant yield capacity, which induced the low nitrogen use efficiencies under the high N rate. The D10.5 combined with N150 gained the highest yield and NUE, indicated that increased plant density with reduced N rate was an important way to improve maize yield and NUE synchronously. 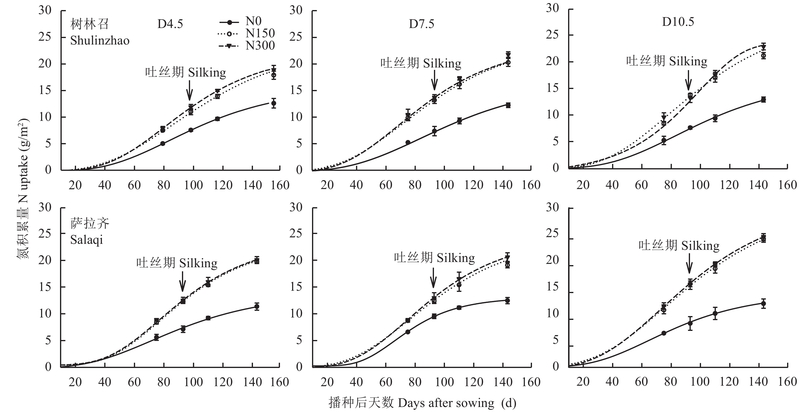 The N accumulation advantage of applying N and increasing plant density was mainly driven by dry matter accumulation during the stage from V14 to R3. N uptake rate was positively correlated with dry matter accumulation rate at the V14−R3 stage, and applying N and increasing plant density remarkably enhanced the response intensity of N accumulation to dry matter accumulation. Under the treatments of applying N and increasing plant density, maize could acquire higher pre-anthesis N accumulation with lower N concentration, which indicated that pre-anthesis N accumulation primarily depended on shoot dry matter accumulation, while post-anthesis N accumulation was mainly ascribe to ear dry matter accumulation. 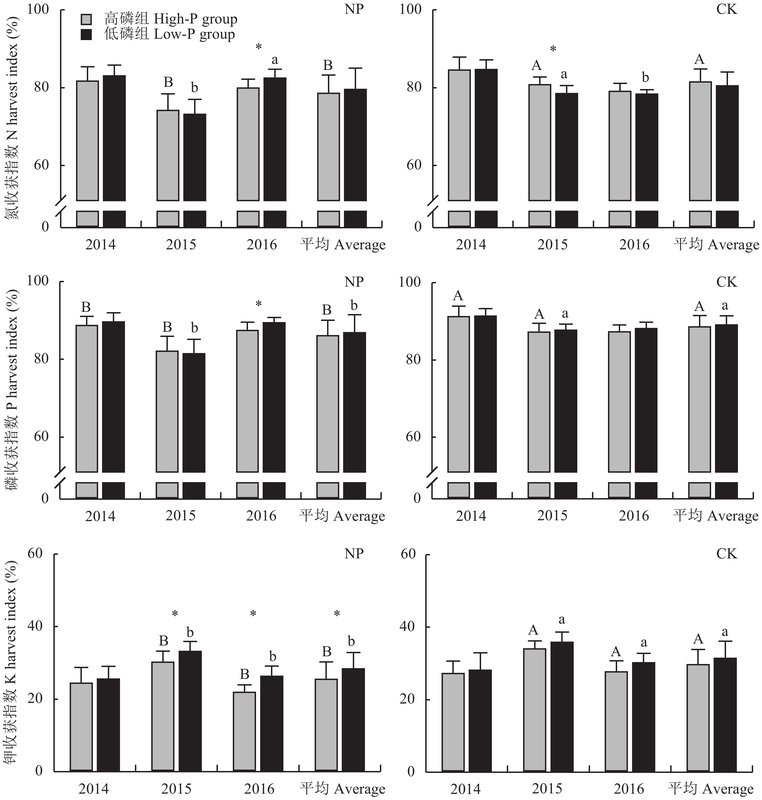 The interaction of N rate and plant density did not affect the nitrogen harvest index (NHI), but the medium N and high plant density significantly improved HI. This indicated that enhancing NUE by reducing N rate and increasing plant density had nothing to do with nitrogen distribution to grain, but was primarily ascribe to grain dry matter accumulation. ConclusionsThe interaction of N rate and plant density influences the NUE significantly through affecting dry matter accumulation and N accumulation. Reasonable reduction of N input while increasing plant density could concurrently enhance maize grain yield and nitrogen use efficiency, which physiologically promoted crop growth rate during the bracketing silking and post-anthesis biomass accumulation, and further drove adequate pre-anthesis N accumulation and post-anthesis grain biomass distribution. ObjectivesShallow rotary tillage is common way in the Hetao Plain, Inner Mongolia. The long term use of the tillage method has led to shallow top soil layer, hard plough pan and deteriorative water capacity. Plowing and subsoiling were attempted in this paper as alternative tillage in the area, so as to provide reference for the choice of suitable tillage methods for the sustainable use of farmland.MethodsThe tested fields located in the Yellow River coast of Bayannaoer, Inner Mongolia, where the maize production relies on irrigation heavily. The fields with maize yield of low (LY, <7500 kg/hm2), middle (MY, 7500−12000 kg/hm2) and high level (HY, >12000 kg/hm2) were chosen, and rotary tillage (RT, 10−15 cm deep), plowing (F, 20−30 cm deep) and subsoiling tillage (S, 30−35 cm) were used in each yield level fields, forming a total of 9 treatments. Soil samples were collected in depth of 0−20, 20−35 and 35−50 cm in each plot. The soil bulk density, soil solid liquid gas, contents of water, total nitrogen, available P, readily available K and organic matter were measured, and the maize yields were investigated. The effects of subsoiling and plowing on soil quality and maize yield were compared with rotary tillage, and the yield increase potential using the two tillage methods were calculated.ResultsCompared with rotary tillage, both the subsoiling and plowing tillage improved soil physical and chemical characteristics and the yields of maize under different yield level farmland, and the effects were in order of subsoiling >plowing > shallow rotation. With the subsoiling and the plowing, soil moisture content was increased by 7.25%−32.11% and 5.36%−21.91%, soil bulk density was decreased by 5.23%−8.61% and 0.69%−4.91%, the R value of solid/liquid/gaseous phases of soil was decreased by 12.24%−89.97% and 7.30%−57.74%, total nitrogen content of soil was increased by 17.88%−55.60% and 9.81%−22.25%, available phosphorus contents were increased by 21.23%−41.26% and 10.84%−22.04%, readily available potassium contents were increased by 36.85%−71.99% and 6.01%−50.99%, and organic matter contents were increased by 28.85%−54.14% and 14.63%−36.38%. The yield increase potential of maize were 22.75%, 16.96%, 16.55% by using plowing tillage and were 29.56%, 25.37%, 16.13% by using subsoiling tillage in the farmlands with low, middle and high yield levels.ConclusionsIn Hetao Plain, Inner Mongolia, replacing shallow rotary tillage with subsoiling and plowing tillage will be able to improve the physical and chemical properties of farmlands, and further increase maize yield significantly, the effect of subsoiling is better than that of plowing. The subsoiling performs well in low and medium yield level of farmlands, and both subsoiling and plowing perform well in high yield farmland. ObjectivesGrazing changes the productivity and soil nutrient cycling of typical steppe, affecting the growth of vegetation and soil microbes, and thus changes the carbon emissions of grassland soils. 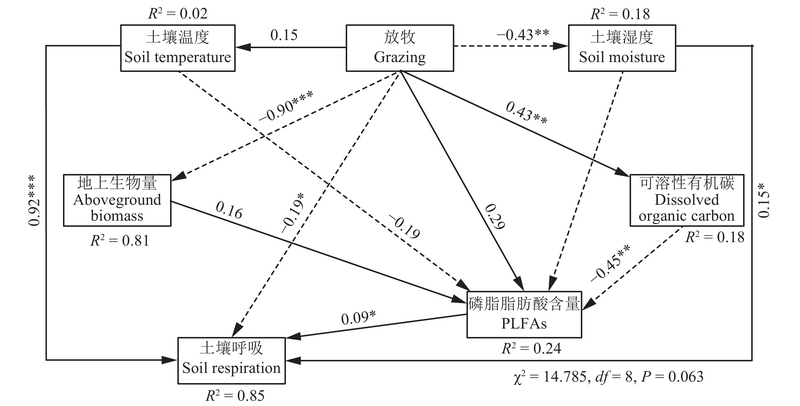 This study analyzed the difference of soil respiration (Rs) rate in the growing season of typical steppe under different grazing measures, to understand the relationship between grassland carbon exchange and carbon balance for grazing. 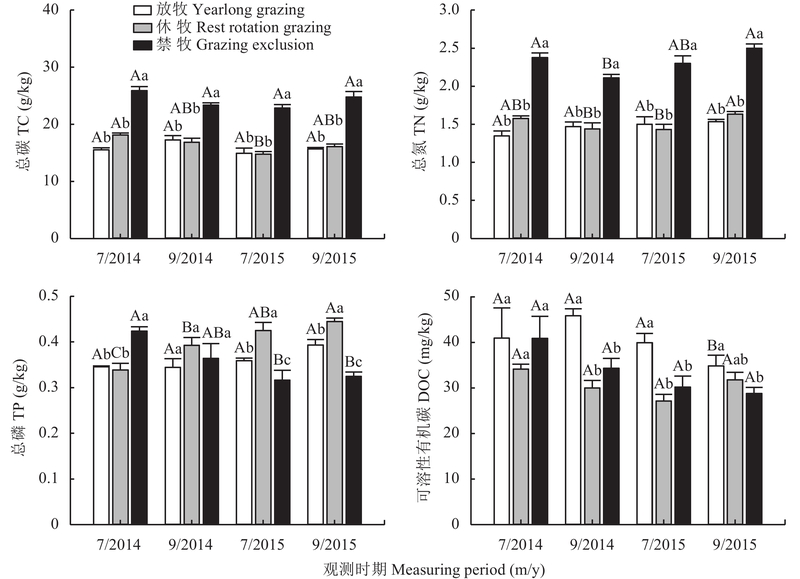 It has great theoretical significance for exploring and clarifying the rational utilization of grassland ecological resources and the trend of carbon emission.MethodsOn three types of grazing plots (yearlong grazing, rest rotation grazing and grazing exclusion) in Inner Mongolia typical grassland, Rs was measured in situ in July and September of 2014 and 2015. The vegetation, soil nutrient contents and microbiological indicators under three grazing system were also analyzed.Results1) The Rs in rest rotation grazing, grazing exclusion and yearlong grazing systems were CO2 1.94, 2.00 and 1.56 μmol/(m2·s), respectively, and showed an order of grazing exclusion > rest rotation grazing > yearlong grazing system. Grazing impacted Rs differently during the growing season, inhibiting Rs in July and increasing Rs in September. 2) Compared with grazing exclusion plots, the aboveground biomass of yearlong grazing and rest rotation grazing were reduced by 70.6% and 47.3%, the root biomass increased by 18.6% and 37.2%, the total soil carbon decreased by 34.5% and 32.0%, and the total soil nitrogen decreased by 37.0% and 34.5%. And compared with grazing exclusion, the root biomass of rest rotation grazing increased by 37.2% (P<0.05). Grazing had different effects on soil dissolved organic carbon (DOC) and soil phospholipid fatty acid (PLFAs). Compared with grazing exclusion control, yearlong grazing increased DOC but decreased PLFAs. 3) Soil respiration was positively correlated with soil moisture and aboveground biomass in July, and positively correlated with soil temperature and soil PLFAs in September. The Structure Equation Model showed that soil temperature (0.905) and moisture (0.188) dominated the variations of Rs through effecting the environment of soil microbial and root development during the growing season; Grazing inhibited Rs (–0.137) by decreasing soil moisture and aboveground biomass.ConclusionsThe main path affecting soil respiration is different with grazing modes. Yearlong grazing inhibits soil respiration by reducing microbial biomass in the growing season, while rest rotation grazing increases soil respiration by enhancing the underground biomass. ObjectivesRapeseed production efficiency heavily relies on reasonable nitrogen (N) supply. 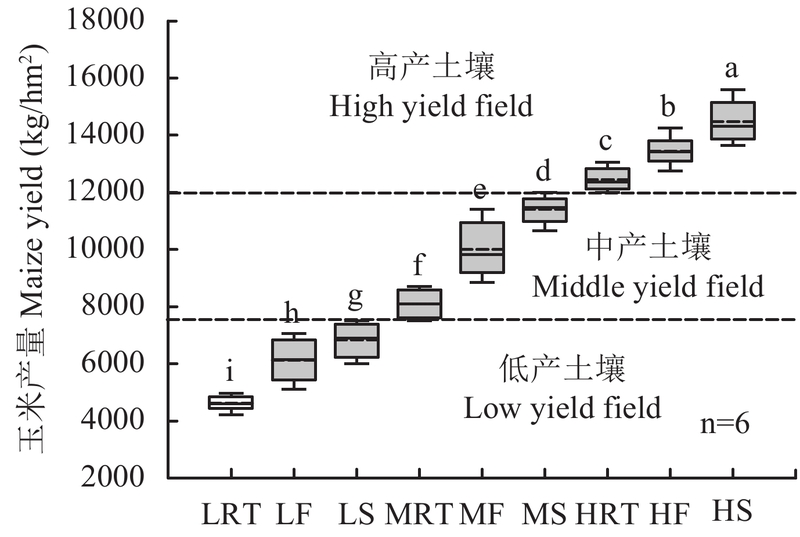 The objective was to unravel the soil N turnover and rapeseed N uptake in two common rotation systems, which would provide guidance for the N fertilizer management.MethodsA split plot experiment was conducted at the Experiment Farm in Huazhong Agricultural University, Wuhan, China. The main treatments were composed of two rotation systems, that was rice–rapeseed rotation (RR) and cotton–rapeseed rotation (CR). The sub-treatments were the application season of nitrogen fertilizers, included: 1) no nitrogen application in both seasons(N0-0); 2) N 150 kg/hm2 only in rice or cotton(N150-0); 3) N 150 kg/hm2 only in rapeseed season(N0-150). The net soil nitrogen mineralization amount in different growing stages of rapeseed were measured using in situ mineralization culture method, and the N uptake in the corresponding stages of rapeseed were measured at the same time.ResultsThe capacity of soil N supply and the total N uptake of rapeseed were considerably enhanced by N fertilizer application. Compared to zero N fertilizer input, the net soil N mineralization accumulations were increased by 101.2 kg/hm2 in RR and 110.0 kg/hm2 in CR, respectively, and rapeseed N uptake were increased by 76.8 kg/hm2 in RR and 96.2 kg/hm2 in CR, respectively, when N 150 kg/hm2 was applied only in rapeseed season. From the distribution proportion, the net soil N mineralization during rapeseed growth period (seeding−stem-elongation period) in CR was more than that in RR, which accounted for 64.5% and 52.3%, respectively; while this tendency was inverted in the late growth stage of rapeseed (flowering−maturity period). The trend of rapeseed N uptake was similar to the net soil N mineralization. 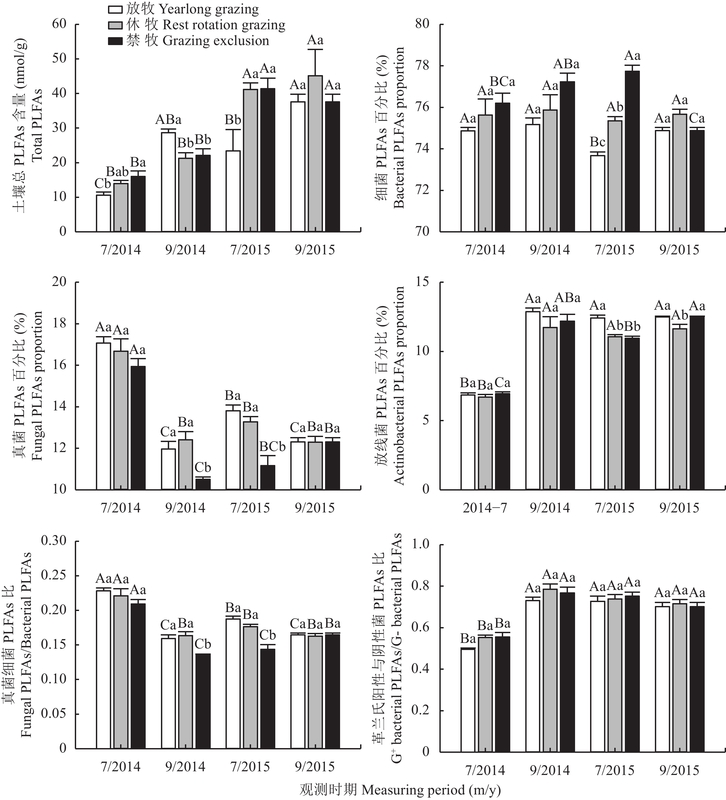 The rapeseed N uptake in CR was 37.1 kg/hm2 more than that in RR during rapeseed growth period (seeding−stem-elongation period), while 18.2 kg/hm2 less than that in RR during the late growth stage of rapeseed (flowering−maturity period), suggesting CR is conducive for rapeseed N uptake in early stages while RR is beneficial to the rapeseed N uptake in late season.ConclusionsIn the cotton−rapeseed rotation system, the rapid release of nutrients from the residual cotton leaves is beneficial to the N supply in the early growth stage of rapeseed; while in the rice−rapeseed rotation, the slow release of nutrients from rice root residues is beneficial to the N supply in the late growing stage of rapeseed. Thus the N fertilizer should be more applied on the early growing stages of rapeseed in the rice−rapeseed rotation, and in the late stages of rapeseed in the cotton-rapeseed rotation. ObjectivesTea is one of the main cash crops in China, balanced fertilization plays very important roles for the high yield and high quality tea production. Many factors including tea tree cultivars, plucking modes and management practices influence the nutrient requirements. The fertilization status was investigated in this paper. The potential and ways of reducing chemical fertilizer inputs were discussed for the sustainable development of tea industry in China.MethodsMore than 5000 tea tree planting gardens, accounting for 5% of the total tea plantation areas across the 14 provinces of China, were surveyed from 2010 to 2014. The questionnaire included fertilizer types, rates, application time, application methods and tea garden areas, tea tree varieties, fertilization costs, and so on. The nutrient input and ratio of organic nutrients were calculated according to the nutrient contents and input amounts of a fertilizer product.ResultsThe total annual N + P2O5 + K2O input in tea gardens of China was 796 kg/hm2 in average. About 46% of the surveyed tea gardens applied organic fertilizers regularly and the organic nutrient amounts were about 15% of the total nutrient inputs. The average annual nutrient input was N 281−745 kg/hm2, P 72−485 kg/hm2 and K 76−961 kg/hm2. According to the current recommendation, excessive fertilization was common in provinces of Shandong, Hubei, Hunan, Jiangxi, Sichuan and Fujian. About 30% of the surveyed tea gardens applied excessive chemical fertilizers. Compound fertilizers had become the main fertilizer type in the surveyed tea gardens. In 80% of tea gardens, the applied compound fertilizers had equal N-P2O5-K2O ratios, which was not always suitable for the requirement of tea tree growth, and was the principle cause for excessive input of P and K, particularly in provinces of Fujian, Jiangxi and Hunan, where half of tea gardens showed excessive input of P and K. In the over-fertilized areas, 30%−40% of chemical nutrients could be decreased through balanced fertilization and increased input of organic fertilizers.ConclusionsExcessive application of chemical fertilizers is common in the tea gardens in China, and serious exceeding is over 30% of tea gardens area. Popularization of compound fertilizers with equal N-P2O5-K2O ratios is responsible for excessive P and K input in 80% of the tea gardens. Organic nutrient only accounts for about 15% of the total nutrient input. About 30%−40% of current chemical fertilizer input could be reduced in the tea gardens through the increase of organic fertilizers and balanced fertilization, the practical reduction should be carried out according to the local situations in different area of China. ObjectivesThe environmental damage of heavy metals mainly depends on their speciation, especially the content and proportion of bioavailable ones. Biochar had been attempted as artificial measures for reducing the content of bioavailable Cd in Cd contaminated soils. The paper examined the transformation of Cd forms in red soils and cinnamon soils when a certain amount of biochar were added, which would deepen the understanding of the remediation mechanism of biochar to Cd pollution.MethodsNatural air-dried red soil (pH 5.21) and cinnamon soil (pH 7.75) of less than two 2 mm in size were selected as tested soils for a incubation experiment. 40 kg of the tested soil were loaded into a 20 L-plastic box, Cd (NO3)2 solution was added to make the exogenous Cd content of the soil to 5 mg/kg, and kept stood for two weeks at (25 ± 2)℃, keeping the maximum soil water content of 70% of filed capacity. Then, biochar were evenly mixed with the soil in ratio of 0, 5, 10 and 20 g/kg soil, and cultured at room temperature for 50 days. Soil samples were collected at 1, 4, 7, 14, 21, 35, and 49 days of culture. The soil pH and organic carbon content were determined, and the soil Cd was divided into five forms by Tessier classification method, and the contents were analyzed.ResultsThe red soil pH was significantly increased with the increase of biochar addition, and after 14 days of cultivation at the biochar addition rate of 20 g/kg, the soil pH changed from acidic to weak alkaline. While the pH of cinnamon soil did not significantly changed with biochar addition. The organic carbon content increased with the increasing amount of biochar in both red soil and drab soil. In red soil after 49 days of cultivation, the content of exchangeable Cd decreased by 0.31 to 0.82 mg/kg. At the biochar addition rate of 2%, the exchangeable Cd content was the lowest (1.24 mg/kg) , the carbonate bound Cd was the highest (1.06 mg/kg). The proportion of carbon-bound Cd were increased by 3.14%−14.21%, and that of Fe and Mn oxide-bound Cd increased by 8.20%−23.96%. In cinnamon soil after 49 days of incubation, the carbon-bound Cd and Fe and Mn oxides bound Cd were increased by 0.94%−2.61% and 0.80%−7.90% with the increase of biochar addition rate. The soil organic carbon content and biochar addition rate presented significant and negative correlation with the exchangeable Cd, yet had a great positive correlation with carbonate bound Cd, Fe, Mn oxide-bound Cd and organic-bound Cd. The pH, soil organic carbon content and biochar application rate presented significant and negative correlation with the exchangeable Cd in red soil, yet had a significant and positive correlation with other four forms of Cd. However, the correlation coefficient in red soil was greater than that in cinnamon soil.ConclusionsComprehensively analyzing the form of Cd in the two types of soil, the remediation effect of biochar in red soil is due to the transform of bioavailable Cd to unavailable form, which is driven by the increased soil pH. Therefore, biochar can be referred as a kind of conditioner in acidic Cd-contaminated soil. ObjectivesCultivation of low Cd accumulation cultivars is an effective measure to minimize Cd influx into the human food chain. The mechanism of Cd immobilization in the roots of the cadmium-safe rice lines were studied in this paper.MethodsA hydroponic experiment was conducted using a cadmium-safe rice line (D62B) and a common rice line (Luhuil7) as the comparing material. The rice seedlings of 3-leaf-1-sprout stage were cultured in nutrient solution for a week, then exposed to solution of Cd at 0 (CK), 0.5 (Cd 0.5), 1 (Cd 1) and 2 (Cd 2) mg/L supplying with CdCl2·2.5H2O for 30 days. 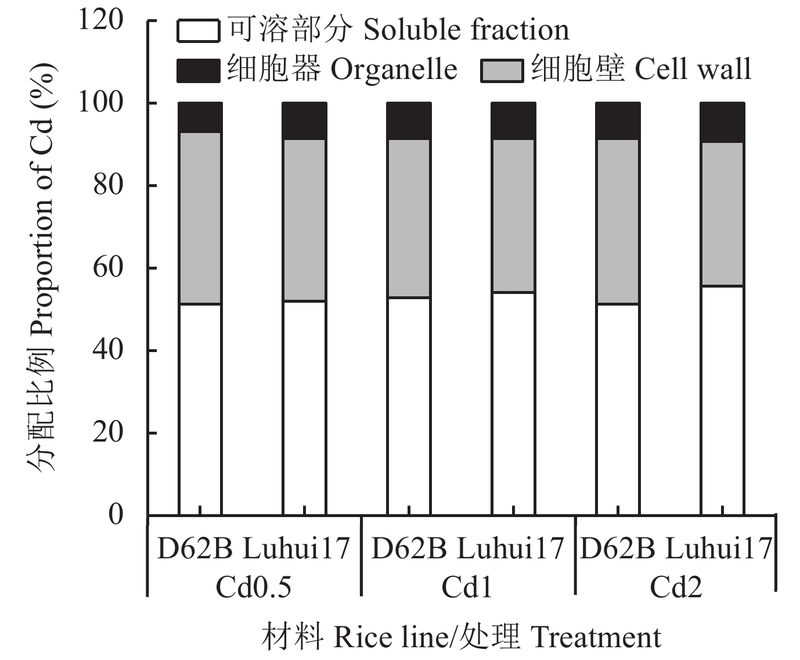 The plants were harvested and divided into roots and shoots to measure the Cd content, and the chemical forms and subcellular distribution of Cd in roots were analyzed, and the modifications of cell wall polysaccharides to Cd of roots cell wall were discussed.ResultsCompared with Luhui17, D62B showed a lower Cd content in different parts, smaller transfer factor, and less Cd translocation from roots to shoots. Besides the decrease of the proportion of Cd extracted by d-H2O in roots of two rice lines, the proportion of Cd extracted by 0.6 mg/L HCl and Cd in the residue exhibited an increasing trend with increasing Cd concentration in the solution, indicating that the mobility and activity of Cd in roots of two rice lines decreased with Cd treatments. Among different chemical forms of Cd in roots of D62B, the Cd extracted by 1 mol/L NaCl accounted for the largest part (48.9%−52.1%). Furthermore, its proportion was 1.11 times of that of Luhui17, while those extracted by d-H2O were lower (82.3%) at 2.0 mg/L Cd treatment, indicating that the mobility and activity of Cd in roots of D62B were much lower than those of Luhui17. The vast majority of Cd was in soluble fraction and in the cell wall of the roots. The Cd in the roots cell wall of D62B was 38.6%−41.8%, higher than that of Luhui17. With increasing Cd content, the proportion of Cd in roots cell wall decreased, but D62B showed a greater capacity than Luhui17 to attain Cd within cell wall with a limit. As the hemicellulose 1 is the major site for Cd storage in roots cell wall, the Cd content in hemicellulose 1 of roots cell wall was 7.74−8.40 times that in pectin of D62B. The Cd content in hemicellulose 1 of two rice lines significantly increased with increasing Cd concentrations. The amount of Cd in polysaccharide of hemicellulose 1 of D62B and Luhui17 increased by 32.6% and 11.2%, respectively, at 2.0 mg/L Cd treatment compared to those at 1.0 mg/L Cd treatment. Furthermore, the total polysaccharide content in hemicellulose 1 as well as the Cd content of roots cell wall increased with the increase of Cd concentration, suggesting that the increase in hemicellulose 1 contributed greatly to the fixation of Cd2+ in the cell wall.ConclusionsThe cadmium-safe rice line designated D62B showed lower Cd content in plant and smaller transfer factor than those of Luhui17. Cd extracted by 1 mol/L NaCl was the major form in roots of D62B. Increasing Cd concentration resulted in conversion of Cd to less mobile forms. Cd in roots cell wall was mainly fixed by hemicellulose 1, and D62B showed a stronger fixation than Luhui17. The stronger capacity of cell wall of D62B to retain Cd was associated with fixation of hemicellulose 1. Cd in the immobile form and immobilization in hemicellulose 1 of roots cell wall of cadmium-safe rice line restrains the translocation of Cd from roots to shoots, which is a major mechanism that differentiate the rice lines the in governing the accumulation of Cd in grains. 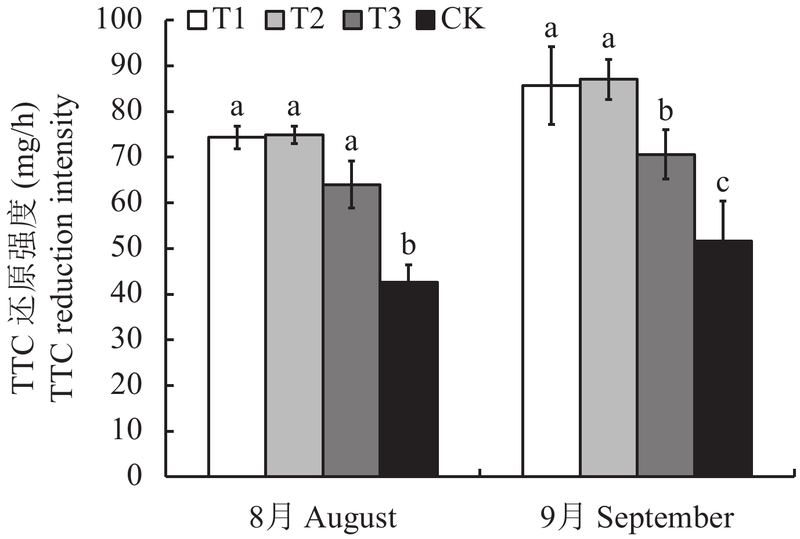 ObjectivesEffect of different concentrations of nitric oxide (NO) on biomass, nutritional and antioxidant quality of pakchoi were studied to provide a theoretical basis for atmospheric NO-associated plant ecological responses and agricultural production.MethodsA pot experiment was conducted using pakchoi (Brassica chinensis L.) as tested material in a closed growth chambers. The exogenous NO was applied in rate of 0 (control), 100, 200, and 400 nL/L in each chamber. The plant biomass was weighed, and the contents of nitrate, soluble sugar and soluble protein were determined, and the total phenolics, total flavonoids and ascorbic acid were analyzed.ResultsCompared with the no NO addition control, the application of 100, 200, and 400 nL/L exogenous NO caused considerable increases by 64%, 42% and 10% respectively in fresh weight and by 88, 61 and 49% respectively in dry weight of pakchoi. The best NO concentration was 100 nL/L. 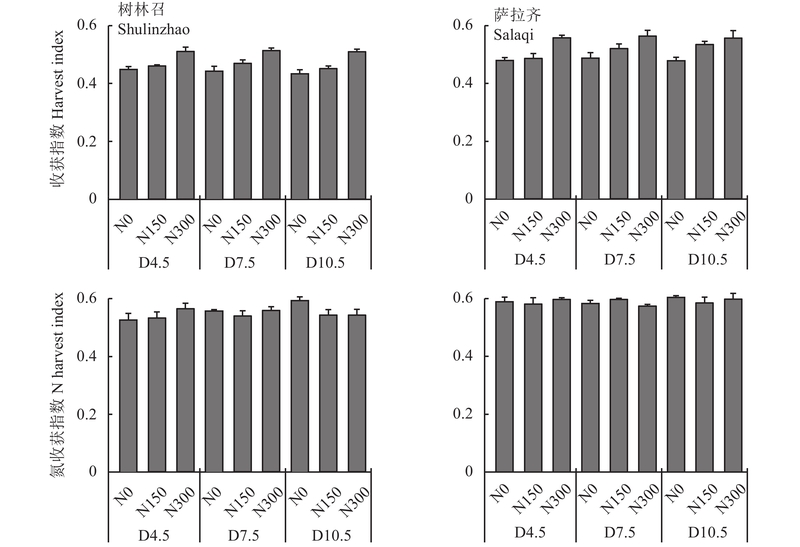 Compared with the control, 100 nL/L, 200 nL/L, and 400 nL/L gaseous NO decreased the nitrate concentrations in pakchoi by 59%, 76%, and 94%, respectively. 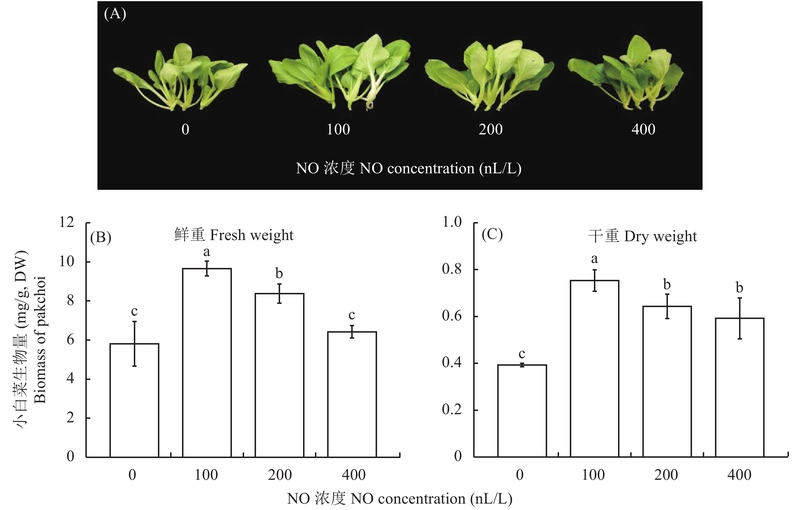 The NO treatments also induced accumulation of soluble sugar and protein in pakchoi, and the most effective concentration for this effect was 100 nL/L. The exogenous gaseous NO application also significantly elevated the levels of several antioxidant compounds including total phenols, flavonoids, and ascorbate.ConclusionsAtmospheric application of trace amount of gaseous nitric oxide could be an effective strategy for improving both biomass production and quality of pakchoi. In general, NO 100 nL/L has the best effect on the growth and quality of pakchoi in greenhouse production. ObjectivesThe conventional soil fertilization is relatively low in fertilizer efficiency in crop production inside the facilities in China. The alternative drip irrigation-fertilization technology was applied in muskmelon planting, and the suitable nitrogen application amount and frequency were studied in this paper.MethodsMuskmelons cultivar of YPTX208 was used as test materials in a mulched drip irrigation experiment inside greenhouse. The irrigation amount was determined using modified Penman-Monteith equation and 1.0ETc was adopted for irrigation. Three N levels of 85, 125 and 160 kg/hm2 (N1, N2 and N3) and three N application frequencies of 5, 10 and 15 days (F5, F10 and F15) were setup for the experiment. Leaf net photosynthetic rate was measured during the fruit enlargement period. The dry matter accumulation, nutrient absorption, fruit yield and quality of muskmelon were measured during the ripening period.ResultsAt the same N level, the leaf net photosynthetic rate was the highest in frequency of F5, followed was F10 and F15, the average increase was 17.4% and 56.1%. 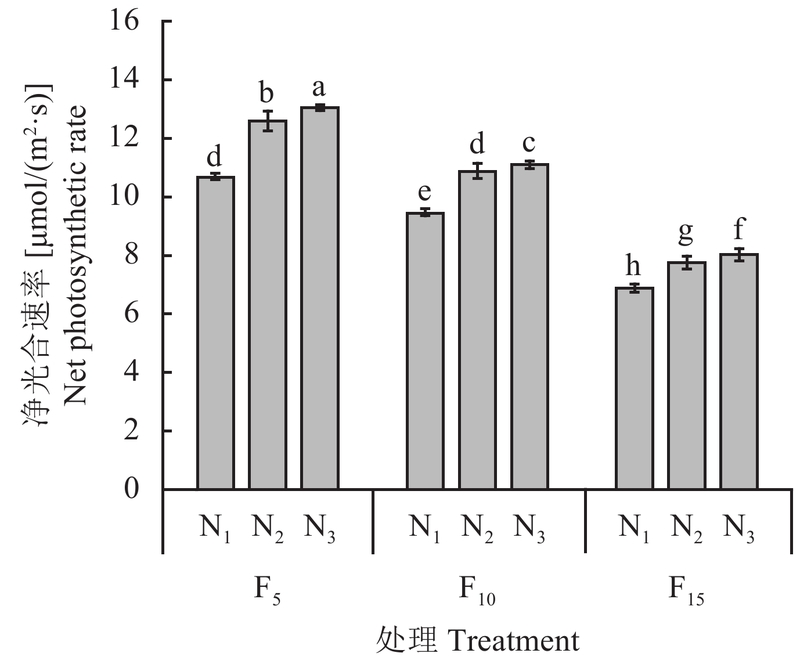 At the same N application frequency, the leaf net photosynthetic rate in N3 was higher than in N1 and N2, the average increase was 22.6% and 9.8%. 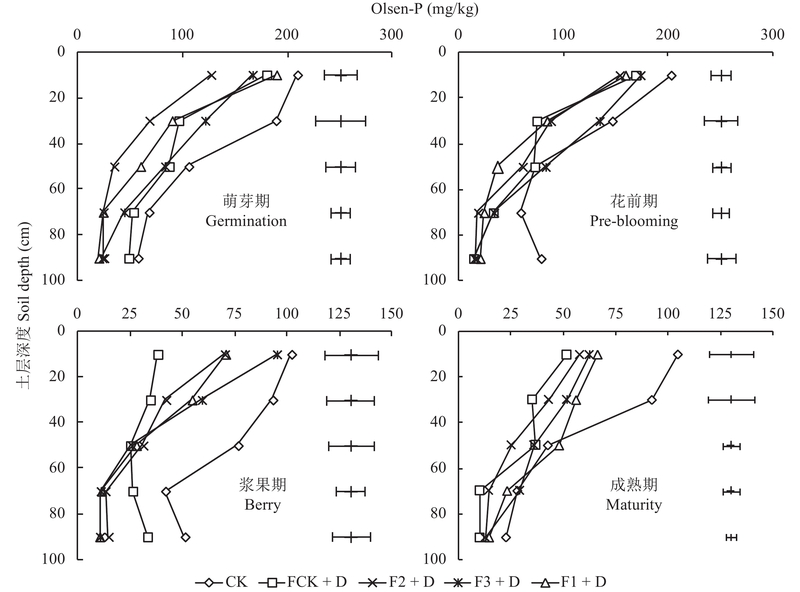 Under N1 and N2 rates, the higher N application frequency significantly promoted dry mass accumulation and NPK uptake of muskmelon; while under N3 rate, there was statistically significant difference in growth and NPK accumulation between F5 and F10. Under the same N application frequency, the yield of treatment N3 was 25.30 t/hm2, which was significantly higher than that in treatment N1 (P < 0.05), but not than N2, the average increase was 7.2% and 0.4%. At the same N application frequency, N2 has the best pulp quality, insufficient or excessive N application was not conducive to the improvement of melon quality. 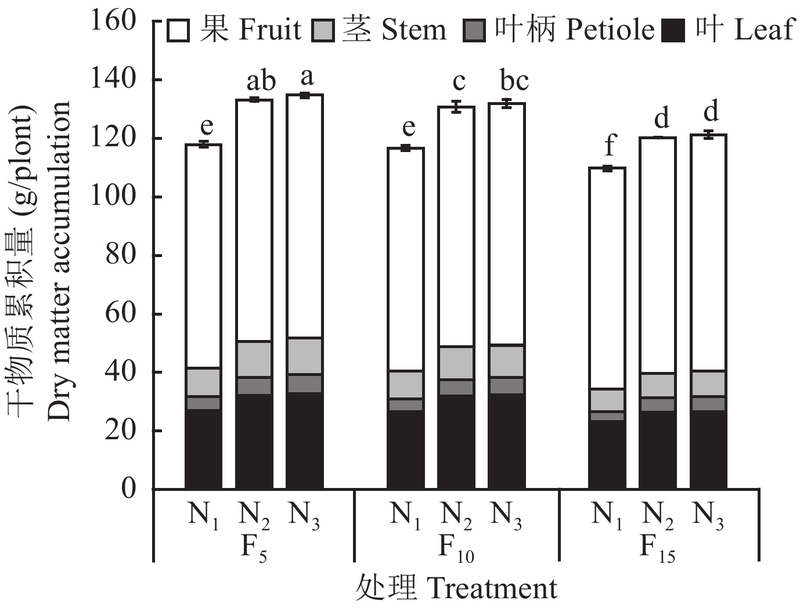 At the same N level, the pulp quality of treatment F10 was higher than that of treatment F5 and F15.ConclusionsNitrogen level of 125 kg/hm2 and the nitrogen application frequency of 10 day are recommended as the better combination, although its yield is slightly lower than that in nitrogen level of 160 kg/hm2 and the application frequency of 5 day. ObjectivesDrip fertigation has been proved to be effective in increasing yields and quality of Red Globe and decreasing the leaching loss of fertilizer nutrients. The proper fertilizer dosage in drip irrigation in grape production was studied.MethodsA field trail was conducted in Huailai County, Hebei Province, 15-year-old grape cultivar of ‘Red Globe’ was used as test materials. The experiment was subjected to 5 fertilizer supply ways and levels, including traditional irrigation and fertilization (CK), traditional fertilization + drip irrigation (FCK + D), fertigation Ⅰ (F1 + D), fertigation Ⅱ (F2 + D) and fertigation Ⅲ (F3 + D). 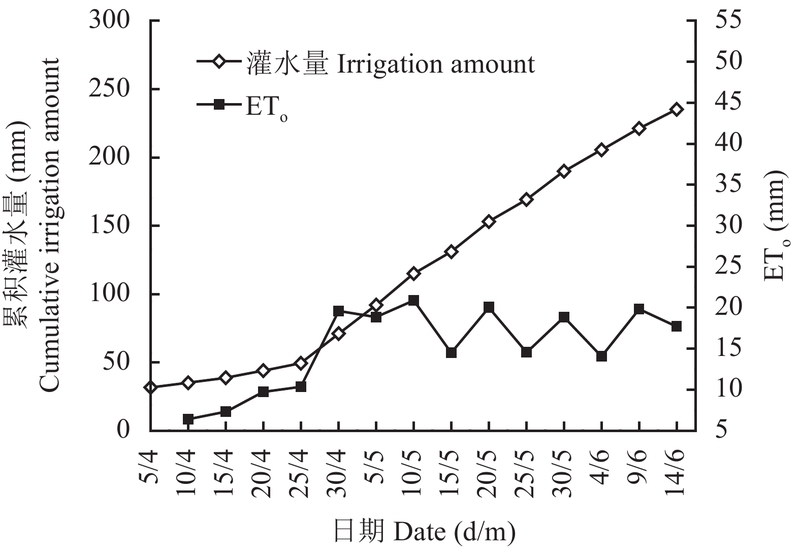 The water consumption in drip irrigation is 55% of traditional irrigation, and the total amount of fertilization in CK and FCK + D were the same (N, P2O5 and K2O: 2708.7, 2615.45 and 1315.2 kg/hm2). Compared with CK, F1 + D’s N, P2O5 and K2O were decreased by 68.32%, 87.61% and 40.47%, respectively, and 17.31% of P and 12.54% of K were reduced in F2 + D and 18.53% of N was further reduced in F3 + D. The N, P and K contents in 0−100 cm depth of soil profile were measured during the grape growing season, the yield, thousand-grain mass, soluble solid content, pH, titratable acidity, Vc content of fresh fruits were analyzed. The water utilization efficiency and partial fertilizer productivity were calculated after the final harvest.ResultsIn 2012 and 2013 the grape yields of the CK were 24115 kg/hm2 and 23020 kg/hm2, and those of the F1 + D were 28830 kg/hm2 and 27272 kg/hm2, which were higher than those of the CK, and increased by 19.0% in average. The thousand-grain mass of the F3 + D were 11.39 and 11.47 kg, and increased by 7.2% in average. The Vc contents of the F1 + D, F2 + D and F3 + D were higher than that of the CK, and increased by 16.7%, 15.2% and 15.6%. On the other hand, the fertilizer and irrigation amount during the whole growth stage had a significant effect on the distribution of soil NPK, there was no significant difference between fertigation and CK in the soil layer of 0−60 cm, but the accumulation of nitrogen and phosphorus in 60−100 cm soil layer of the F1 + D were the lowest, and were 21.37 and 28.56 mg/kg respectively, the accumulation amounts of potassium of the F1 + D, F2 + D and F3 + D were lower than CK, however, there was no difference among F1 + D, F2 + D and F3 + D, which were 126.11, 117.75 and 139.00 mg/kg. In addition, their maximum water utilization ratio and PFP were higher than CK, which were increased by 209.1% and 266.3% respectively. Compared with the traditional management, the water and fertilizer input and labor cost were saved by 17857.5, 18547.5, 17752.5 yuan/hm2, respectively.ConclusionsUsing drip fertigation technology could greatly improve yields and quality of grapes, reduce N and P leaching, and increase farmers’ income. And the best comprehensive performance of these treatments in production, quality and efficiency was the F1 + D, which increased by 47145−51024 yuan/hm2 compared with the CK. ObjectivesApple replanting disease (ARD) is a frequently occurring plant disease, which inhibits growth of trees seriously. Under replanted condition, absorption, distribution and utilization of 15N-urea in Malus hupehensis Rehd. seedlings were studied, to reveal mechanism of ARD and provide a theoretical basis for prevention and control of ARD.MethodsA pot experiment was carried out using Malus hupehensis Rehd. seedlings as the material. 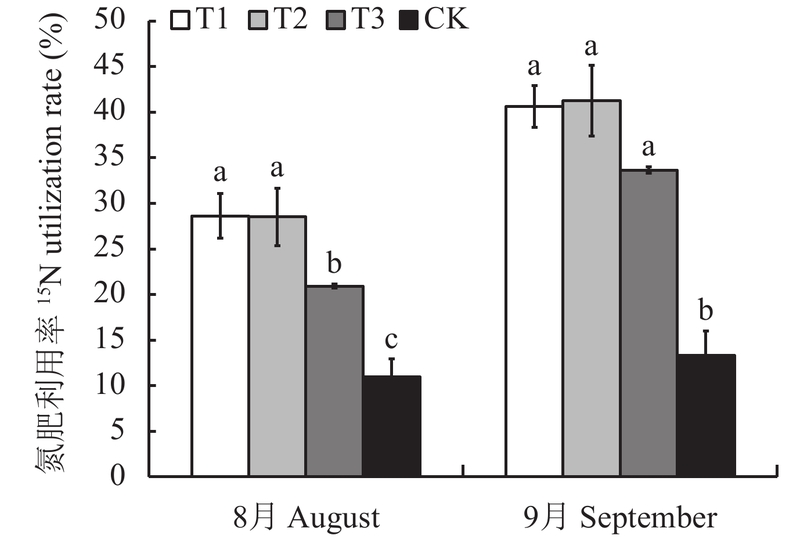 Four treatments, including replanted soil fumigated by methyl bromide (T1), replanted soil pasteurized (T2), wheat field soil (T3) and replanted soil (CK) were carried out to explore the effect of ARD on absorption, distribution and utilization of 15N, using isotope tracer technique. The biomass, root, nitrogen and microorganism were measured in August and September.ResultsContinuous cropping inhibited the growth and root architecture of Malus hupehensis Rehd. seedlings significantly. Compared to T1, T2 and T3, the fresh weight treated with replanted soil was reduced by 46.77%, 46.50%, 27.38%, respectively. The plant height was reduced significantly, by 41.97%, 41.95%, 23.51%, respectively. In addition, the root surface area of seedlings decreased by 56.21%, 55.72%, 48.04%, respectively, compared to T1, T2 and T3. Continuous cropping also deteriorated the environment of soil microorganisms. The fungal biomass in replanted soil was increased significantly, which was 1.76 times of the control. However, the bacterial biomass accounted for 78.77% in the wheat soil. The ratio of bacteria and fungi was also decreased significantly. The contribution of nitrogen derived from fertilizer (Ndff) in replanted organs was also decreased, due to continuous cropping. In September, the Ndff of replanted leaves was reduced by 61.34%, 58.65%, 57.36%, respectively, compared to T1, T2 and T3. Moreover, continuous cropping affected the distribution ratio of 15N in different organs seriously. 42.11% 15N was measured in root of replanted seedlings, which was higher than other treatments in September. However, the 15N distribution ratio in replanted leaves was lower. With increase of replanted time, the 15N distribution ratio in leaves became less. Only 29.25% 15N of replanted leaves was measured in September. Furthermore, the ratios of 15N utilization was reduced significantly under replanted condition. In September, the ratios of 15N utilization was only 13.33% and reduced by 67.19%, 67.68%, 60.39%, respectively, compared to T1, T2 and T3. In addition, continuous cropping affected the root system and function seriously. The root activity was decreased (39.71%, 40.64%, 26.80%, respectively) and H+-ATPase activity of mitochondrial plasmalemma was also reduced (41.44%, 38.24%, 25.78%, respectively), compared to T1, T2 and T3.ConclusionsSoil microorganism was the main factor for apple replanted disease. Continuous cropping not only inhibited the growth of Malus hupehensis Rehd. seedlings and root architecture, but also affected root functions. Furthermore, nitrogen absorptivity and utilization ratio were reduced significantly. Continuous cropping also affected nitrogen distribution in different organs, leading to root consuming more nutrition and reducing supply to other organs. ObjectivesChlorella pyrenoidosa are high in protein contents and rich in all kinds of essential amino acids and various nutritional health care factors, which have been listed as a new resource of food in China in 2012. 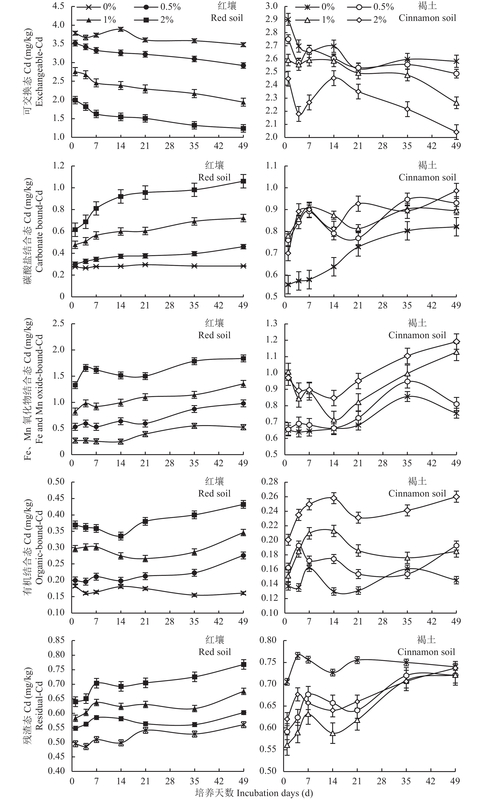 The paper studied the specific nitrogen stress levels and days for culture of Chlorella pyrenoidosa.MethodsThe Chlorella pyrenoidosa was inoculated to the basic BG11 medium for autotrophic cultivation and BG11 medium supplemented with 10 g/L glucose for mixotrophic cultivation, then obtained seed algae cells. The conventional nitrogen supply of 18 mmol/L sodium nitrite in the BG11 basic medium was used as control, mediums with 3, 6 and 9 mmol/L sodium nitrite were prepared as low nitrogen stress treatments. The algae cell biomass was measured by dry weight and the total lipid was quantified by staining method. The protein and starch contents of algae cells were determined by ultraviolet spectrophotometry, and the three-dimensional fluorescence spectra was used to analyze the components and contents of algae extracellular polymeric substances (EPS).Results1) The Chlorella pyrenoidosa cells from both autotrophic and mixotrophic cultivation could grow under low nitrogen stress conditions, algae cells from autotrophic cultivation responded more rapidly to the change of low nitrogen stress and started to grow rapidly on the first day after transfer. The highest cell dry weight and lipid content of the algae were harvested in the NaNO3 6 mmol/L treatment groups. After culturing for 4 days, the algae growth reached stable phase, the cells dry weight from autotrophic and mixotrophic cultivation sources was 2.56 and 4.62 g/L, respectively, and the corresponding lipid contents reached to 15.5% and 39.3%, which were all notably higher than their normal N controls. 2) Low N stress could improve the lipid productivity of Chlorella pyrenoidosa. Both the highest lipid productivities of algae cells derived from mixotrophic cultivation were in NaNO3 6 mmol/L treatment, that for the mixotrophic algae cells was 129.56 mg/(L·d) on the 4th day, which was 7.95 times of that for the autotrophic algae cells. 3) The initial contents of intra- and extra-cellular protein and starch (polysaccharide) in cells from mixotrophic group were notably higher than those from autotrophic group. The lipid, protein, starch contents were decreased significantly in the 2nd or 3rd day of culture, then the intra- and extra-cellular protein contents continued to decline, while the lipid and intracellular starch contents began to increase with an apparent inflection points. The change trends of the lipid and intracellular starch content in algal cells were basically synchronous. 4) The EPS components in the Chlorella pyrenoidosa contained the tryptophan-like proteins (TLP) that advantage to algae cells flocculating and some humic substances including humilic acid (HA) and fulvic acid (FA) that disadvantage to flocculation. 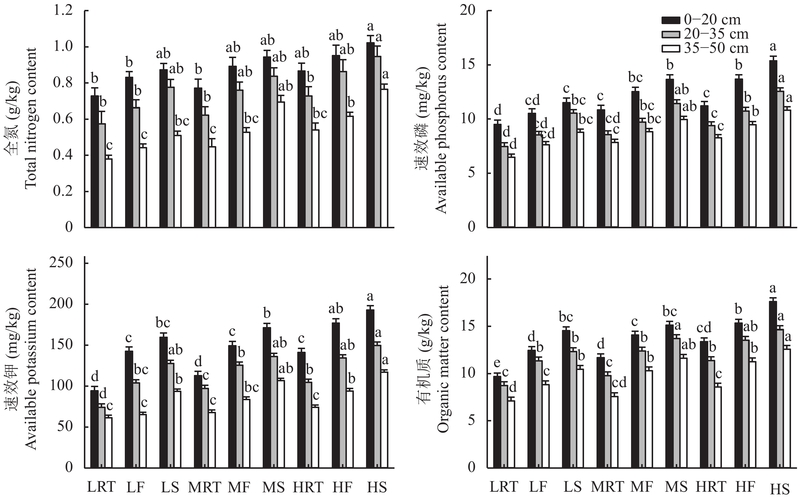 After culturing for 4 days in NaNO3 6 mmol/L medium, the content of TLP in algea cells from autotrophic cultivation was increased by 40.3% than the control, while the content of TLP, HA and FA in algae cells from mixotrophic cultivation were 83.6%, 74.8% and 54.8% of that in control groups, respectively. The corresponding self-flocculation rate of algae cells from autotrophic and mixotrophic cultivation source were 78.5% and 80.3% respectively, which were notably improved than their corresponding controls.ConclusionsThe response to low-nitrogen stress varied between the autotrophic and mixotrophic Chlorella pyrenoidosa cells. The biochemical component contents of algal cells are influenced by the culture medium nitrogen supply levels and culturing days. The low nitrogen stress influences the self-flocculation rate of algae cells remarkably by changing the EPS compositions of Chlorella pyrenoidosa. For the tested Chlorella pyrenoidosa, the suitable nitrogen stress level is NaNO3 6 mmol/L and the cultural time is 4 days for the highest lipid productivity and flocculation performance. High salinity is one of the major abiotic stressful factors affecting crop growth and productivity in agriculture system of the world. Therefore, improving the salt-tolerance of crops has attracted worldwide attention. Silicon element (Si) is the second most prevalent element in the earth’s crust excepting for oxygen.When the pH of a solution is less than 9, silicon is usually absorbed in the form of silicic acid [Si(OH)4] in plants. Although silicon has not been recognized as essential element for higher plants, it is considered to be a ‘beneficial element’. Especially, silicon can increase plants resistance to multiple stresses and improve the growth and development of plants under stress conditions. Many studies suggested that silicon actively involves the physiological and biochemical processes in plants under salt stress, and silicon has a crosstalk with the signaling molecules that include ethylene (ET), salicylic acid (SA), and polyamines (PAs). In this paper, the silicon accumulation and transportation, the beneficial regulatory role of Si are reviewed when the plants are subjected to the salt stress. Major progresses: 1) Si could be absorbed by plants in active, passive and rejective routes. Silicon transporters play important roles in silicon uptake, but the silicon uptake systems and their functions in different plant species need more investigations. 2) Silicon could alleviate salt damage through mediating ion balance under high salinity. Application of silicon can specifically decrease the uptake and transport of Na from roots to shoots, and make evenly distribute Na+ crossing the whole root section. In addition, silicon affects the uptake of some essential nutrients (e.g. Ca, K, N) in plant to alleviate adsorption competition between salt ions and essential nutrients. Recent studies suggested that polyamines play a regulatory role in promoting uptake of silicon-mediated nutrients under salt stress. 3) Both the up-regulation of silicon-mediated aquaporin gene expression and osmotic adjustment play important roles in increasing water uptake. 4) Silicon application alleviates oxidative stress damage to the plants by regulating the antioxidant defense and decreasing the production of reactive oxygen species (ROS). Meanwhile, silicon could alleviate the salt stress damage to the photosynthetic apparatus and prevent salt stress from destroying pigment, and thus improving the photosynthetic process. 5) Omics-based technologies, transcriptomic and proteomic analyses, provide powerful tools for better understanding the responsive mechanisms of silicon-triggered in alleviating environmental stresses at the molecular level. Both the transcriptome and proteome studies reveal that silicon could regulate the plants responses to salt stress through modulating the expressions of transcription factors and hormone-related genes as well as the translation of associated proteins. 6) The utilization of silicon mutant will be helpful to better understand the regulatory role of silicon in the physiological-biochemical metabolic processes in plants. ObjectivesGenotypes, ecological conditions and cultivation techniques resulted in great differences in the growth and nutrient use efficiencies of yams from different habitats. The growth characteristics and nutrient requirement of three main cultivated yam varieties were compared, aiming to provide a support for high-efficient nutrient management in sustainable production of yam.MethodsThe main yam varieties were Bangyao, Xiaobaizui and Ziyao in the central Hebei plain. The yam samples were respectively collected at 80 d, 110 d, 140 d and 180 d after sowing in the conventional field. Dry and fresh biomass were weighed, and the N, P and K contents in yam tubers, stems and leaves were determined.ResultsThe biomass of stems and leaves increased firstly and then decreased with yam growing, while the maximum biomass of tuber appeared at the harvest. 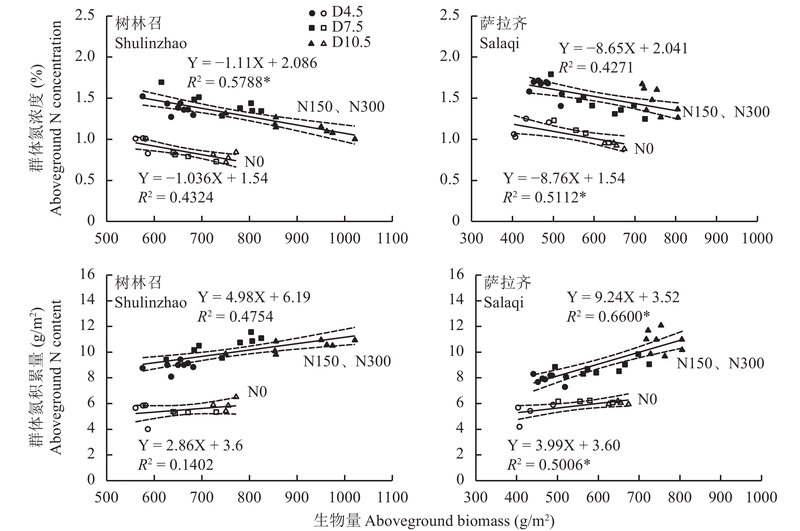 The tuber fresh biomass of Bangyao was significantly higher than those of Ziyao and Xiaobaizui, but the tuber dry matter of Bangyao was not higher because of its lower planting density. Compared with Ziyao and Xiaobaizui, the maximal accumulation speed of fresh and dry biomass of Bangyao were not higher, but the fleet accumulation durations of fresh and dry biomass of Bangyao were both longer, and the time reached the maximal accumulation rate was later. In addition, the significant differences in accumulation, distribution and use efficiency of nutrients were found among the three yam varieties. The rank of accumulation nutrients was all showed in the order of K2O > N > P2O5 and tubers > leaves > stems in the tested three yam varieties. Bangyao had the highest accumulations of N, P2O5 and K2O, and highest production efficiency of nutrients, but no significant difference was found between Ziyao and Xiaobaizui. 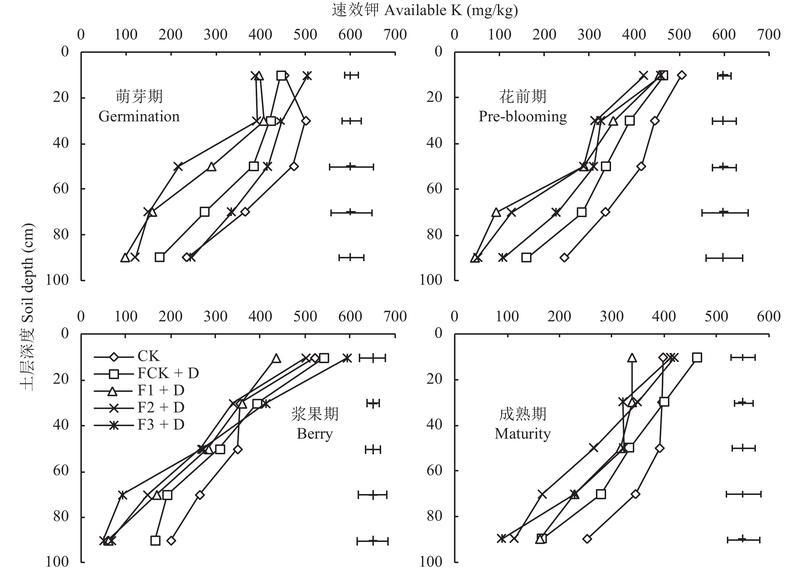 Bangyao had the longest fleet accumulation duration and the highest maximal accumulation speed of N and K2O, while the characteristics of accumulation dynamics of P2O5 had no significant differences among three varieties.ConclusionsThe characteristics of growth and nutrient accumulation had no significant differences between Ziyao and Xiaobaizui, but the biomass, yield and production efficiency of nutrients of Bangyao were significantly higher than those of Ziyao and Xiaobaizui, and the nutrient demand for forming unit yield was significantly lower than those of Ziyao and Xiaobaizui. ObjectivesVermicompost is a homogenous particle produced by earthworms digesting organic wastes, which has been proved to enhance soil fertility, improve soil structure and promote crop growth. In this paper, the effects of different ratios of vermicompost to soil on the microbial properties of substrate and the growth and quality of leek were preliminarily studied, in order to provide reference for the widely use of vermicompost in high quality vegetable production. MethodsA pot experiment was conducted inside the greenhouse of China Agricultural University from April to June in 2015. The substrate were prepared by mixing 4 mass percentages of vermicompost and soil in pot: 0/100% (CK), 20%/80% (T1), 60%/40% (T2) and 100%/0 (T3). After harvest, the biomass of leek, total soluble protein, total soluble sugar and chlorophyll contents were measured. The NPK contents and the microbial composition of substrate were analyzed. Results1) Vermicompost addition significantly increase the total N, readily available K and organic matter in the substrate, and the better the higher proportion of vermicompost in the substrate; 2) Compared with no vermicompost addition CK, the new root ratio of leek was 5.75%, 6.39% and 22.23% higher in T1, T2 and T3 treatments. The contents of total soluble protein of leek were significantly increased by 1.84−5.97 times and the total soluble sugar contents increased by 1.49−1.60 times (P < 0.05); 3) The microbial diversity index of substrate was significantly increased by the addition of vermicompost. 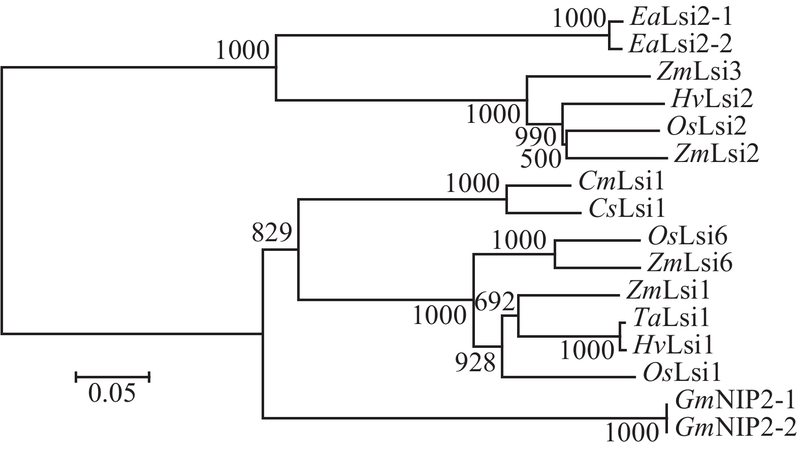 The bacterial fragments of 116, 118, 130, 226, 297 were significantly increased (P < 0.05) and the fungal fragments of 71, 91, 153 and 351 decreased (P < 0.05). ConclusionsVermicompost could improve microbial community structure, improve the bacterial and fungal diversity, increase nutrient availability of the based substrate, and promote the growth and improve the quality of leek. The vermicompost can be directly used as substrate and shows the best result. Considering the profit and cost, adding proportion of 20% will make good enough substrate for high quality vegetable production. Copyright© 2006-2010 Plant Nutrition and Fertilizer Science.